There are few clues to this one. The signature is P. Norton and the date is 1994. 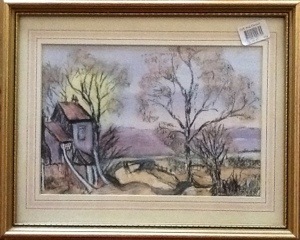 I did find 2 watercolours by a P.Norton on an auction website. One was of Killarney in Ireland and the other of somewhere in Scotland. I thought this might be Ireland and found a photo of Ross Castle in Killarney in S.W Ireland but I am not convinced. Anyway, it hardly matters when this is such an attractive pastel drawing and it only cost £3. Perhaps it is a good thing that it could be anywhere and it might just remind you of somewhere.